Unwind from the knitty gritty! Visit Camelot on Thursday, December 13th from 6-8pm with our friends from Yarnbyrds! We’re having a special Holiday Open Knit with Yarnbryds Pop-Up Shop! They’ve got the yarn, we’ve got the wine, and you’ve got the needles! 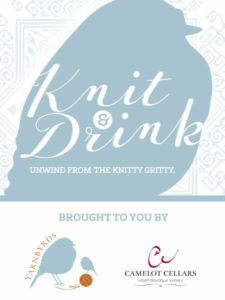 Spend some time meeting fellow knitters and wine lovers for an evening of fun. Visit the Yarnbyrds inside Po-Up shop, grab your yarn and you’re good to go. You definitely do not want to miss out on this night!